Our last event was an amazing success -- thank you all so much for your support and love. Check out the photos to relive some of the magic! may 20/17: Our Final event, upcoming! 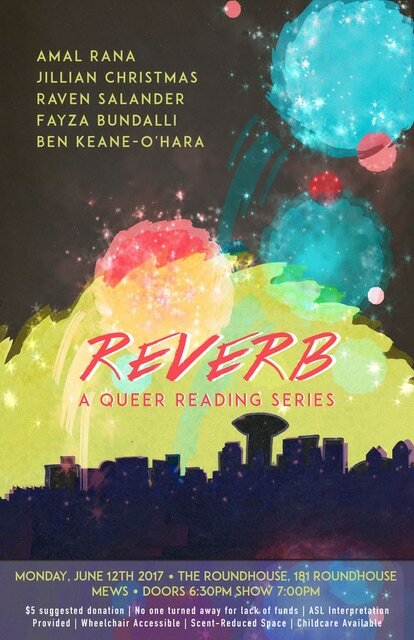 We are so excited to announce our final event as REVERB! Join us on Monday, June 12th for a poetic extravaganza to celebrate the work, community, and art this series has created over the last 4 1/2 years. Featuring an incredible set of readers who are all REVERB alums, cake and other delights, a photobooth and community feedback station, and most likely some emotional speeches. Don't miss it! More accessibility information available here. It’s not over yet! But, as you may have heard through the glittery gossip grapevine that sustains us all, REVERB is coming to a close in the near future. We’re both ready to open up some space in our lives for other things, and that means it’s time for our beloved series to come to an end. We are so excited to have one more regular reading in November and then to go out with a fabulous farewell next spring - stay tuned for details on how to celebrate with us! In the past four years of amazing queer programming, there have been too many magical moments to count. We have collaborated with Kickstart Disability Arts and Culture, Verses Festival of Words, the Queer Arts Festival, For a New Accessibility Convergence, and our beloved venue and supportive foundation Gallery Gachet. The past two springs have seen us hosting Vancouver book launches for books the world simply can’t do without - Octavia’s Brood: Science Fiction Stories from Social Justice Movements, edited by adrienne maree brown and Walidah Imarisha, and even this page is white, Vivek Shraya’s poetry debut. The talent that has graced our stage for four years is too immense to list here but you can bet we’ll be thanking and celebrating each one of our artists as we prepare to close this tremendous circle. 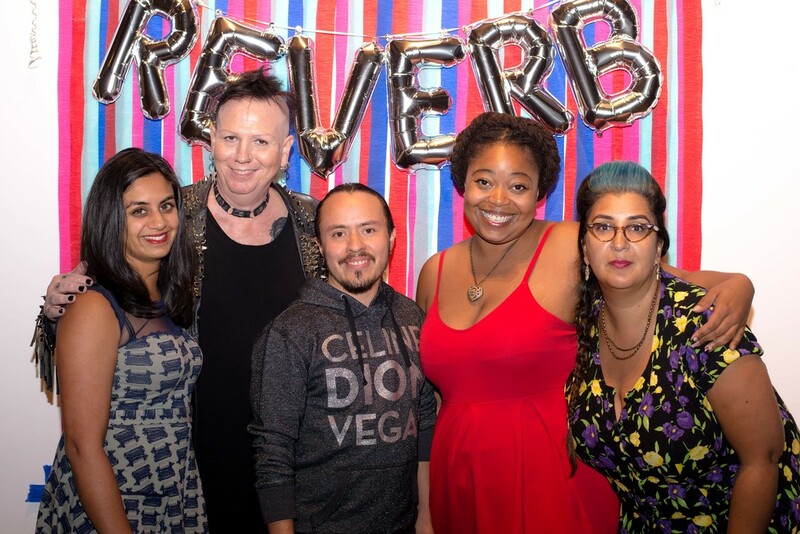 Beyond a place to showcase emerging and established queer writers, REVERB has become a space for community and shared learning. It has been a joy and a honour to work together to co-create the kind of magic that centres accessibility and justice in all forms. We’ll obviously be back to wax poetic about all things REVERB and to make our thank you speeches! If you haven’t had a chance to join us for an event, or just aren’t ready to say goodbye, don’t worry - there’s still time! We can’t say any more about our farewell feelings without giving credit to the incredible folks who work with us, including all of our amazing volunteers, various coordinators and everyone who has given and continues to give so much to this special project. Shout-out to Ben, Aly, Laine, Maggie, April, Anthony, Cecily, Behshid, Justine, and Tiaré in particular. Your patience, energy, commitment, creativity - and love! - has kept us motivated in so many meaningful ways. Our work - and yours - will continue, as it always does, in other forms, venues, and shapes as the future unfolds.